My ultra-Catholic mother's no-no list was long. The following were forbidden to me and my sisters: Barbie (hussy), Ken (hussy-lover), Halloween wax lips (we might choke and die), high tide (we might drown and die) and roller coasters, Ferris wheels, and Matterhorns (certain death). 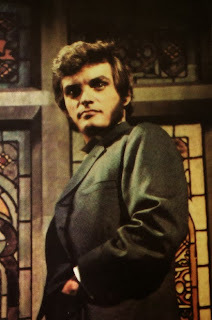 Ma objected to soap operas in general (they would give us dangerous "idears"), but when it appeared in 1966, the gothic soap opera Dark Shadows ranked high on her objectionable-content list. Good Catholics did not deliberately invite Satanic creatures such as vampires and werewolves into their home every four p.m. God may have seen fit to create full moons and black cats, Ma reasoned, but my sisters and I could protect ourselves by staying indoors when the moon waxed large. And if a dark feline should fix its devilish green eyes upon us, we could cross the street or else just cross ourselves. Ma's second objection to Dark Shadows: it wasn't "real." My mother's brown eyes narrowed like slits on a piggy bank if we so much as hinted we enjoyed a little fiction. Her worst accusations were "Did you make that up?” and “Are you telling me a story?" Dark Shadows was an ongoing story, and thus stuff and nonsense, poppycock, a barrel of fazool, and a bunch of hooey. Objection numero tre: Ma firmly believed we should not come home from school and sit around on our lazy culs (American translation: butts) like a "buncha-lazy mamalooks" (American translation: nonexistent) in front of the TV. Especially when we could be doing something useful, like dusting my father's bowling trophies. Even at age seven, I knew the show was not godly. But in my opinion, it was still as Catholic as all get out. Which was to say, it was gory. In the dark, smelly pews of Saint Ann's Church, my sisters and I regularly knelt before statues of saints who had volunteered to be broken on the wheel or asked to be crucified upside down. These characters made Dark Shadows' vampires and werewolves seem tame in comparison. As for stories—I loved nothing more than a good one, especially if it were set in another place and time in which ladies got to wear swishy long skirts. And as for my father's bowling trophies: my opinion was that if he wanted to win 'em, he could dust the damn things himself. So where was my disapproving mother at four p.m. on the fateful day one of my sisters first turned on Dark Shadows? Was Ma down in the cellar stuffing wet towels into the dryer? Or was she once again at the funeral parlor, where she clocked so many hours we suspected she stuck around after early viewings to dust and polish her own coffin? I’m not sure. But Ma was certainly elsewhere on the afternoon when my sister Jo—ever more daring than I—threw down her dust rag and ran over to the TV, a behemoth black-and-white Zenith, which delivered only ABC and CBS. Since the knob was broken, Jo had to use a tweezers to switch on the screen. She rotated the rabbit-ear antenna on top, tweaking the aluminum foil on the end to get even better reception. I watched, with fascination and horror, as the opening credits rolled. First came eerie music, which sounded like my uncle playing "viulino" on his Stanley saw. Then waves breaking on a rocky shore, then the dark outline of a many-turreted mansion. Finally, the words DARK SHADOWS rolled across the screen in Gothic print. I gulped. Scary things really scared me. I preferred gentler fare, like The Waltons, an evening series about a hard-working multigenerational family trying to eke by in the Depression. The Waltons lived in a sprawling farmhouse in good old healthy Appalachia. They did not come into contact with fog. Or cliffs. Or bats. Or lightning. They would no more think of time traveling than they would consider driving their jalopy to the nearest brothel. "This looks scary," I said to my sister. "Don't be a baby," Jo said. "Are you sure you don't want to watch Gomer Pyle?" "If you don't want to see it, then go back to dusting." I stayed put. But I sat cross-legged, because I was scared I'd pee from fright. The sets of Dark Shadows alone were enough to raise the gee-willikers on the back of my neck. Every room in the Collins family mansion was dark and candlelit and ominous as church on Passion Friday. Doors creaked. Gaslights flickered. The characters—whom I did not yet know by name—looked pale and ghoulish. The women—who resembled Druid-esses who got lost on the way back from Stonehenge—wore hooded cloaks over diaphanous floor-length dresses. The men wore ruffled shirts, brocade vests, and velvet capes that surely didn’t come off the rack at the Edward T. Malley Department Store in downtown New Haven. The plot—such as it might be called—eluded me. Why was the young girl with the long blond hair making eyes at that hawked-nosed guy carrying a cane? What was the significance of the red leather book left on the velvet couch? Why did the camera linger so portentously on the portrait over the fireplace? I didn't get it, except to know that it had something to do with a family curse. But that didn’t matter. The minute I lay eyes on the dark, brooding brow of the character named Quentin, all thoughts of Gomer Pyle and John-Boy Walton were laid to rest. I had fallen in love! with a man whose name began with the letter Q! Which meant that after the first episode was over, I just had to watch another. I went to great lengths to gawk at Quentin on a regular basis. I switched on Dark Shadows—sound off—while my mother was in the kitchen making meatballs and braciole. I invited myself over to the houses of girls whose mothers did not object to afternoon TV-watching. I prayed sick relatives would die so my mother would depart for the funeral parlor at four p.m. While she mourned, I could have half an hour minus commercials alone with the man of my dreams. Quentin wore an ascot. He sported mutton chops—not a little unlike the guys on Gunsmoke—and often arched his brow. (The significance of this gesture eluded me, yet it only deepened my love for him.) Alas, Quentin was not in love with me, but with Daphne, a governess and raven-haired beauty. Quentin and Daphne enjoyed furtive kisses in graveyards. They ventured down dark hallways by flickering candlelight and up staircases that took them back in time, causing Daphne to cling to Quentin's manly chest as she cried out, "Quentin, we're trapped! We're trapped in another century!" I never failed to swoon as Quentin enfolded Daphne in yet another passionate embrace. My love for Quentin was rivaled only by my fear of The Head. The Head was just that: the disembodied head of a man preserved under a glass dome, reminding me of the way the Eucharist was kept inside the tabernacle. I couldn't figure out if The Head was dead, alive, or just a symbol of Satan. His eyes sometimes followed Quentin and Daphne and the rest of the Dark Shadows crew as they moved about the candlelit chambers. He was silent, except at key moments, when his disembodied (be-headed?) voice echoed throughout the house, warning the characters that they were about to suffer for the sins of their ancestors. The Head terrified me. I was convinced God had put him on Dark Shadows to punish me for watching it. At night, in bed, after I said my prayers and asked God for Dark Shadows forgiveness, I tried to dream of Quentin. Yet I lay there quaking in the dark, convinced The Head was hiding in the closet, next to my dead grandmother's fox furs (whose own heads sported teeth as sharp as vampires and eyes beady as bats). The Head watched me censoriously. With brown eyes that looked suspiciously like…my mother's. The Head, and its connection to Ma’s ever-present gaze, gave me such nightmares that I began falling out of bed. The thud of my body hitting the hardwood floor awoke even my father, who could sleep through the most violent, Dark Shadows-like thunderstorm. Finally Ma demanded to know what I was dreaming about. I refused to tell her Dark Shadows, but somehow she knew. The tweezers were removed from the top of the TV. Now at four p.m.—unless I had sneaked over to a friend's house—I could only stare at the blank, dusty screen, longing to climb behind its greenish glass. True, The Head lay on the other side. But so did Quentin. And I desperately wanted to get trapped. With him. In another time. Another place. Another story. I was bereft. Then, one day in the school library, I picked up a book called Jane Eyre. Reader, you know what happened next. Soon I had forgotten Quentin and was swooning instead over the original bad boys of the 19th century: Mr. Rochester, Mr. Darcy, Heathcliff. I couldn't get enough of their brooding. Their glowering looks. Their commanding presence. But the best thing about these guys wasn’t their romantic appeal. It was the fact that, unlike the vampires of Dark Shadows, these men really did live forever. Once lodged in my imagination, their stories played over and over on the screen inside my head—and even Ma couldn’t turn them off. <Rita Ciresi is director of creative writing at the University of South Florida and author of the romantic comedies Pink Slip, Blue Italian, and Remind Me Again Why I Married You, and the story collections Mother Rocket and Sometimes I Dream in Italian. Visit her website at www.ritaciresi.com.